Does Oil Affect Animals’ Cellular Machinery? Ann Tarrant has a soft spot for a tiny, tentacled creature. So what if starlet anemones (Nematostella vectensis) are spineless invertebrates that burrow in mud in stagnant brackish tidal marshes? 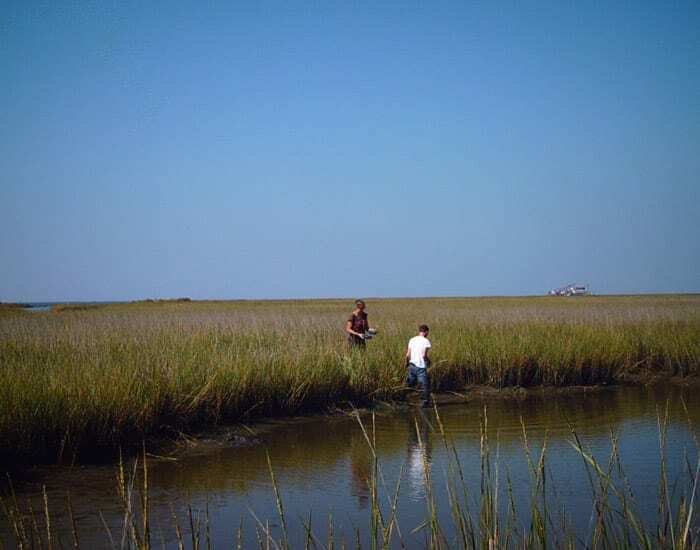 To live there, they have to be remarkably adaptable to all sorts of changing conditions: big swings in temperature and salinity, for example, or sudden onslaughts of pollutants. 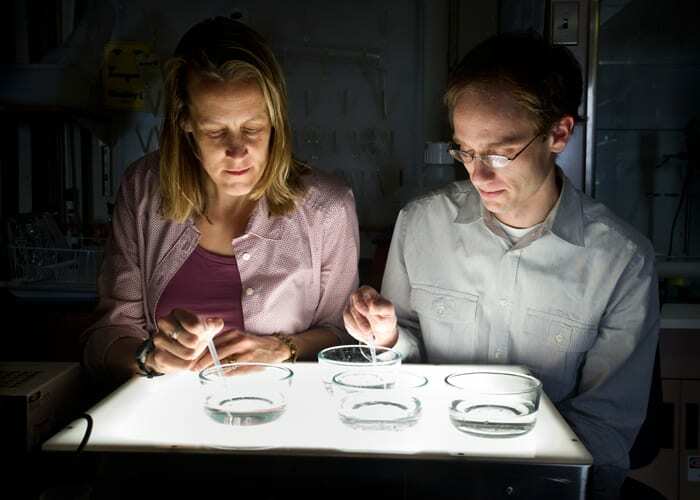 Tarrant’s lab at Woods Hole Oceanographic Institution (WHOI) contains a nursery of glass dishes filled with Nematostella in all stages of their life cycle. WHOI postdoctoral fellow Adam Reitzel has collected anemones from Canada to Georgia and perfected methods to grow them in the lab. He and Tarrant know the anemone inside and out. Its entire genome has been sequenced, so they know every gene in its 1-centimeter-long orange body. And they have developed a method that reveals which genes are turned on to set in motion biochemical pathways that allow Nematostella to cope with stressful environmental conditions. Like, for example, a mammoth slug of light sweet crude oil from the blown-out Deepwater Horizon oil rig. 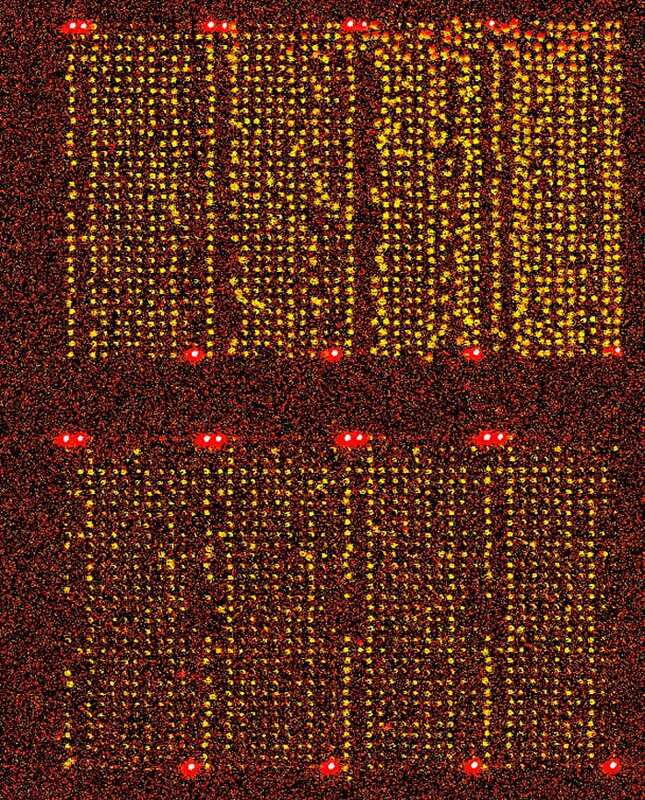 The scientists employ a technique called a DNA microarray, a small glass slide with a systematic arrangement of applied dots containing DNA. Each dot corresponds to a separate known gene from Nematostella. The microarray, developed by Tarrant with WHOI research specialist Jed Goldstone, can detect exactly which genes are expressed, or activated, to produce enzymes that detoxify pollutants and deal with other biochemical stresses stemming from the Gulf oil spill. With a National Science Foundation Rapid Response grant, Tarrant and Reitzel are collaborating with Matthew Jenny, a specialist in genetic sequencing and a former WHOI postdoctoral investigator who is now a molecular biologist at the University of Alabama. 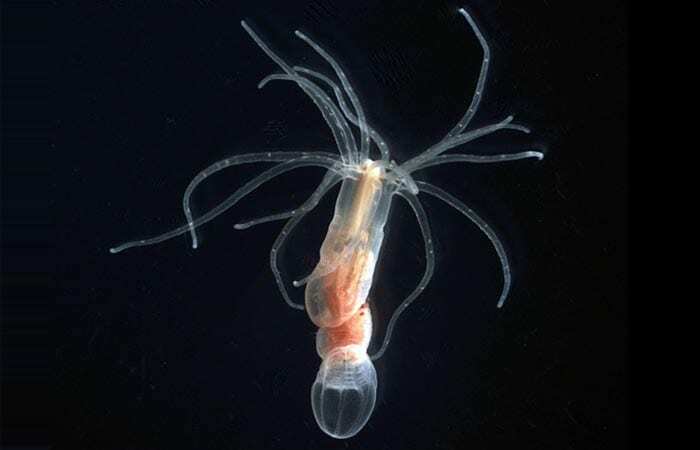 Nematostella may be low on the evolutionary tree of life, a “primitive” animal not very different from the earliest ones on Earth, but many of the genes and biochemical pathways it uses to metabolize contaminant chemicals are so fundamental that they have been retained in other invertebrates and vertebrates, including humans. Their research will test the responses of anemones under three sets of conditions, none of which have been studied before. In the first experiments, the researchers will use two different routes of contaminant exposure, through the water and through oil-contaminated food—brine shrimp reared in the presence of oil. (“Nematostella‘s not picky!” said Tarrant. “They’ll eat oil-laced brine shrimp.”) Chemicals introduced through the skin and digestive system may activate different genes and have very different effects, she said. Second, Tarrant thinks that the use of dispersants to help clean up the spill could magnify the oil’s toxicity, so they’ll study Nematostella kept in seawater containing oil alone or oil with dispersant. Nematostella is closely related to reef-building corals, but much easier to work with in the lab, Tarrant said, and this research could uncover insights that help scientists understand potential impacts to coral reefs from oil pollution. “There’s a lot of concern about how corals might be affected by oil and pollutants in areas where there’s a lot of traffic by oil tankers,” she said.